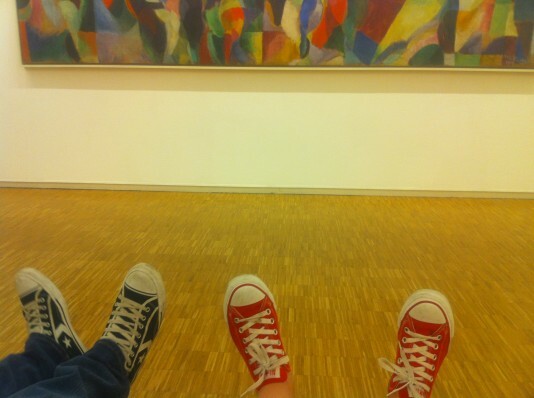 The Chucks belonging to Rachel and Littlest Lowe Adam pounded Parisian pavement this summer. Where did your Chucks take you? Click on more photos to see what kind of adventures Rachel & Adam had, and email info@twoelle.com with your summer Chuckin’ adventures so that we can feature them here! When Danny and our model friend Salome Steinmann got together for an impromptu photo shoot, they both went straight to the same Steven Alan shirt. It’s Danny’s favorite summer shirt, and Salome didn’t mind stealing it from him. So, boys & girls, feel free to share with each other! Steven Alan button downs are the perfect token of generosity, whether you’re buying them for yourself or for the boy you hope to steal them from! Friends, we’ve observed the requisite mourning period, and we’re now ready to talk about it. This week on Top Chef, our dear Arnold Myint met an untimely elimination. After yelling at our television, we contented ourselves with the fact that Arnold did exactly what he had set out to do. He added panache and a hint of Myint to every challenge he faced, never compromised himself, took home a challenge victory, and surely proved that he is “more than just a Louis Vuitton bag.” And here’s the best part: even though he’s packed his Louis knife bag, we can still keep him in the game. For the time being, we can make like Tom & Padma and visit PM, Cha Chah, and Suzy Wong’s to judge for ourselves. 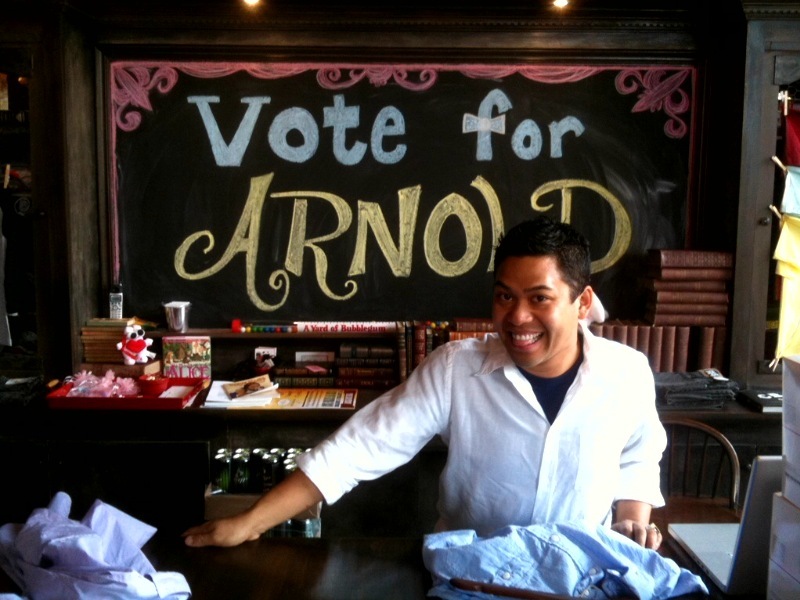 Then, when the time comes to vote for Fan Favorite, we can all rally behind Arnold to make him the fan’s choice. You’ll always be our top chef, Arnold!!! As he skyrockets to fame on this season of Bravo’s Top Chef, dear friend Arnold Myint is taking us with him! 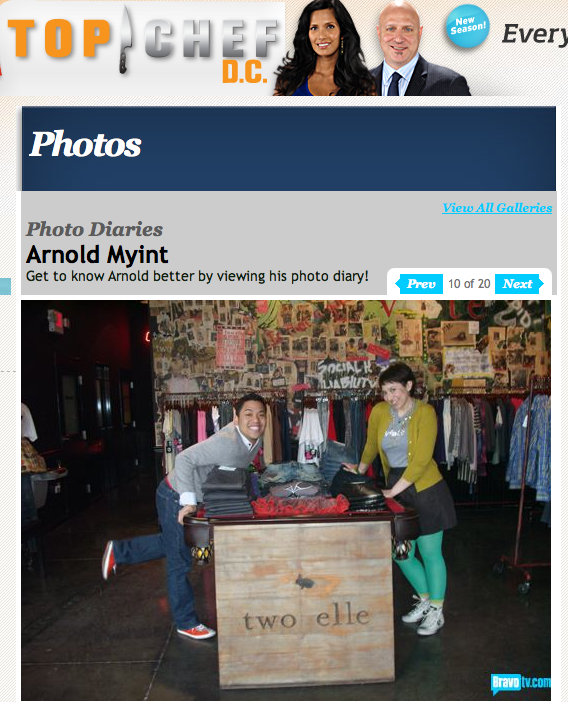 Arnold teaches the public more about him with his photo diary on bravotv.com, and he of course includes a stop at two elle to catch up with Rachel and the latest supply of Steven Alan bow ties. We suggest you tune in Wednesday nights to watch Arnold in all his glory. This week, for example, he stirred up a little drama, earned his team a foodie win, and sported a Modern Amusement v-neck sweater courtesy of yours truly. Keep winning, Arnold! And forgive us in advance; we envision a summer of Arnold obsession!